UMBC has groomed me into a leader which, as a shy and nerdy freshman, I never imagined that I could be… Mentors placed me in the position to speak before the world and lead other students in promoting diversity in technology. During her time at UMBC, Randi Williams has seen herself grow from a shy freshman to a vocal advocate for women and minorities in technology through work in prestigious internships and fellowships with leading research institutions and tech start-ups. Williams has been heavily involved on campus, as a Meyerhoff Scholar, a member of the Honors College, and co-founder and former vice president of the popular HackUMBC student group and annual hackathon. She has also completed internships at the NASA Jet Propulsion Lab, MIT Media Lab, and Jawbone, a wearable technology company. It was the experience at Jawbone, through the prestigious CODE2040 Silicon Valley fellowship program, that inspired Williams to co-organize the first HackUMBC event. Williams has received numerous awards, including the INCOSE Scholarship, Xerox Minority Technical Scholarship, Ida Greene Fellowship, and Pfizer Scholarship. She is a member of the engineering honor society Tau Beta Pi and the liberal arts and sciences honor society Phi Beta Kappa. With a particular interest in human-robot interaction and creating wearable technology for people with disabilities, Williams will return to MIT to earn a master’s degree in media, arts, and sciences, working with the Personal Robots Group of the MIT Media Lab. She plans to complete a Ph.D. and develop technologies that address global challenges in education and healthcare. 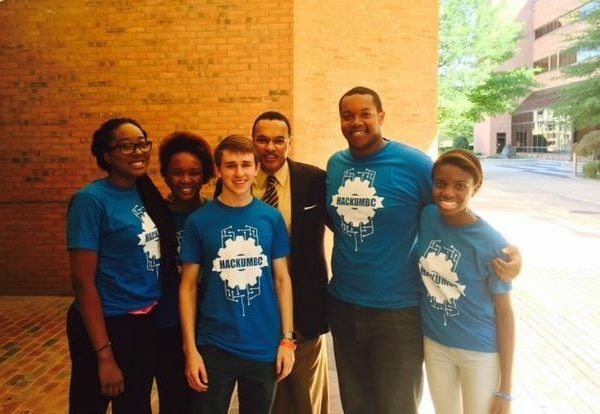 Image: Randi Williams, far right, and other HackUMBC attendees pose for a photo with President Hrabowski; photo courtesy of Randi Williams. Portrait by Marlayna Demond ‘11 for UMBC.